Box's memorial to the First World War was bult in 1920 (photo left courtesy John Harris) to honour the dead of the First World War. Twenty-five years later it was tragically repeated with the outbreak of World War 2. You can read more about the origin of the Box War Memorial in our headline article. Box in 1943 tells the story of Box Highlands School and its earliest teachers. Nameless Places records the underground aircraft factories, the workers, and where they lived in the wartime village. D-Day 1944 Footpaths concerned villagers as the war continued in mainland Europe and the Far East. After the War The consequences including changes in the village and the return of troops. Epitaph Reflections on the war by Captain John Durnford of Greenslades, Market Place. 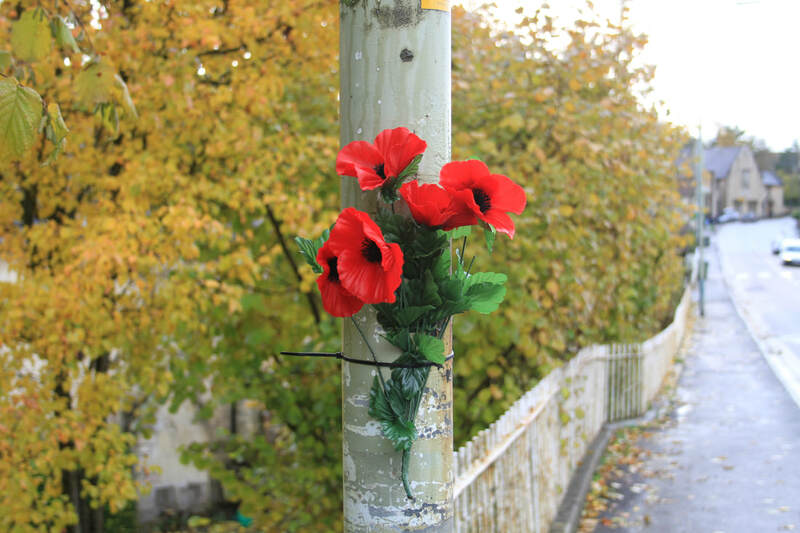 How our village remembered its servicemen on the centenery of the armistice marking the end of fighting in World War I. Internationally, about 9.7 million people died as a direct result of the warfare and millions more from their injuries and the effect of gas. Russia had nearly 2 million fatalities, Germany 1.8, France 1.4, Austria 1.3 and Britain 0.8 million. To put these numbers into context, in Wessex today (from Gloucestershire to Cornwall and the Isle of Wight and all places in between) there are about 7.5 million people. The numbers defy comprehension. Click Here for village photographs. Brunt and Garland Families The Box families who invigorated the inter-war years in the village. Old Jockey Families Story of old family photograph revealing marriage to the next-door neighbour. Dr James Piri Martin Beloved doctor's retirement from the village shortly before his death. Odee Harris Poet, lover, theatre impresario and Maisie Gay's partner. Also ventriloquist in World War 2. Greenland Family Story of family journey from the Lamb Inn to the Falkland Islands via Siege of Ladysmith, South Africa. HR James Story of the Ironmongers in the Market Place, seen in photograph (right). RAF Rudloe Manor Group 10 Headquarters during wartime and aterwards. Wasn't it a lovely day for an outing - or better to walk? Doesn't that all sound unusually exciting? There are dozens of additional articles and photos in dedicated series which you can access by clicking on the links below. You can use the button right to search for all website references.